Until now, Apple has not held a launch event or simply announce the presence of the iPhone 8. Surprisingly, the smartphone has already been sold in China. As expected, the iPhone 8 turned out to be a counterfeit product. The device is not actually made by Apple. Even so, the design of the iPhone 8 replica is actually quite good. The sales package includes the name "iPhone" printed using the San Francisco font, similar to the original. There is also a model number and description "Designed by Apple in California". The fake iPhone 8 also comes with a double camera on the back. IPhone 8 is rumored to be present with such a camera configuration. However, it does not mean that the Chinese fake product is able to mimic the overall detail Apple normally presents. 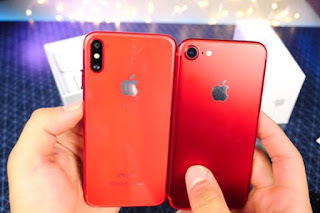 When users are observant, the information presented in the sales package also has a difference in layout compared to the original iPhone sales package. Once the packaging is opened, can be seen more clearly the fake iPhone 8 made in China. Typically, Apple always includes a logo sticker in their purchased product packaging. But the sticker will not be found in this Chinese version. When turned on, it will be seen that the fake iPhone 8 screen does not meet the front. At the top and bottom there is a black piece, making it much different than the leaked information about the iPhone 8 that had been circulating. The operating system used also in the form of Android 6.0. The appearance has been modified in such a way that similar to the IOS operating system. Bixby Comes in Samsung Middle-class Smartphone?